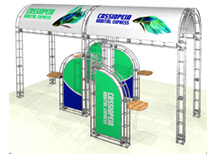 Island truss displays are ideal for 20x20 booth space or island booths at most convention centers. 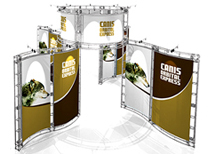 We offer many different sytles so you can find an option that will work with your booth configuration. 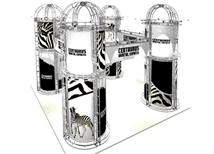 We also offer custom configuration at no cost including 3D renderings! 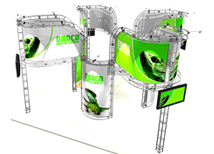 All truss components are universal so you can make a 10 foot or 20 foot display out of any one of these configurations or you can add on to create an even larger island exhibit. 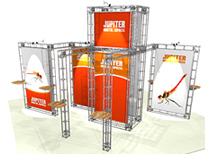 These truss systems will be sure to make an impact at any show! 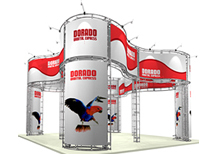 We also offer hanging banners that work great in island booth spaces! 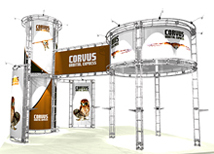 All of our Island Orbital truss displays are manufactured by Orbus Company. They are all made in the USA and are designed for a lifetime of use. 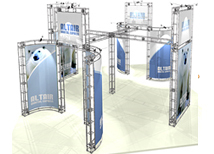 We offer a huge selection of in stock configurations as well as custom options for any size booth. 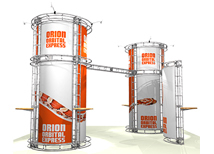 One of the highlights of the Orbital truss system is the low cost of custom designs. 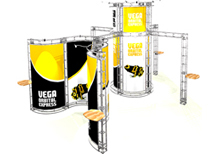 3D renderings are free and all the parts cost the same amount as the ready to go kits. If you add more parts you only pay extra for those parts, if you take parts away the cost will decrease. 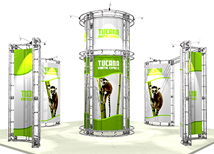 This is very uncommon for most custom display systems. 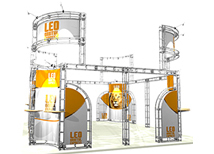 With the island displays above you can create 20 foot or 10 foot booths out of the same parts! 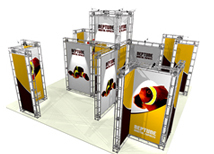 We have very affordable hanging banners that work perfect with this system!